Located in Albaicin, the Palacio de Mariana Pineda is a five minute walk from the Madrasah of Granada and offers a swimming pool and a jacuzzi. It offers expansive city views and 4-star rooms. The Palacio de Mariana Pineda has a number of services including a beauty salon, massage services and a beauty centre. Also on offer for guests are meeting rooms, a secretarial service and a hair salon. The hotel also provides guests the added convenience of Wi-Fi. The air-conditioned rooms at the Palacio de Mariana Pineda are themed. A hair dryer, cable / satellite channels and a mini bar can be found in each room of the hotel. A desk with an electrical outlet, a desk and a TV are also on offer in each room. Guests are able to take advantage of a gourmet breakfast, which is available on request every morning. Room service is also offered during certain times. The hotel enjoys an ideal location, allowing guests easy access to a range of popular attractions. Guests can access Federico Garcia Lorca Airport (GRX) via the hotel's shuttle service in under 30 minutes. 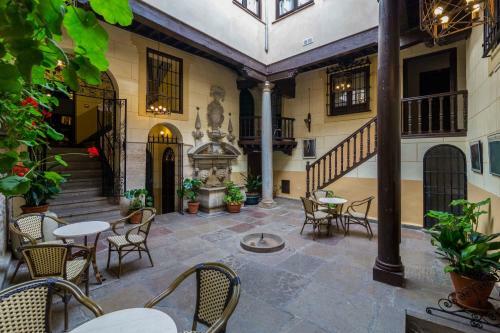 This hotel is 998 metres from the Alhambra entrance, 179 metres from Plaza Nueva (the absolute centre of Granada), 1639 metres from the train station and 2985 metres from the bus station.